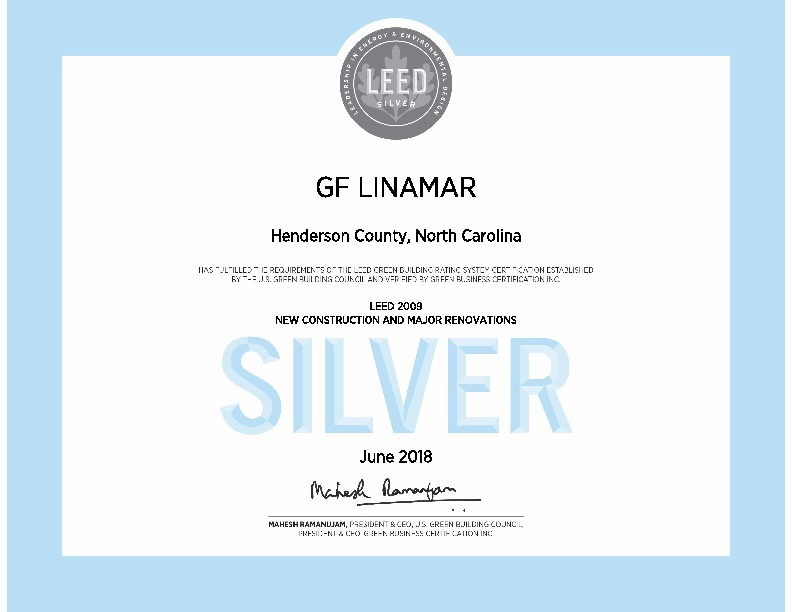 In August, GF Linamar’s new die-casting facility in Mills River, NC was certified LEED Silver by the US Green Building Council. LEED, which stands for Leadership in Energy & Environmental Design, is the most widely used green building rating system in the world and is a globally recognized symbol of sustainability achievement. To receive the LEED Silver certification, GF Linamar constructed its facility to meet a rigorous set of 109 possible criteria. The company had to demonstrate that its 57-acre site was prepared in a sustainable manner and that the building was designed and constructed with regionally-sourced and sustainably produced materials and resources, ensuring the highest indoor air quality possible while also maximizing water efficiency and energy usage. GF Linamar is a state-of-the-art, high-pressure die-casting facility that located to Ferncliff Park in Mills River, NC in 2016 and began production in 2017. The company is a joint venture between Canadian-owned Linamar Corporation and Swiss-owned GF Casting Solutions, a Division of Georg Fischer Corporation. The company produces lightweight aluminum and magnesium structural and powertrain components for the automotive industry. Ferncliff Park, which has been called “America’s Most Beautiful Industrial Park” is a North Carolina Certified Industrial Park focusing on sustainability and environmental stewardship, with covenants and design guidelines crafted for the customer, employee, and corporate brand in mind. As part of the process of building a facility in Ferncliff Park, which is also home to Sierra Nevada Brewing Company, GF Linamar was required to pursue LEED certification. To learn more about GF Linamar LLC, please visit their website here. For more information on LEED Certification, please visit of US Green Building Council here.